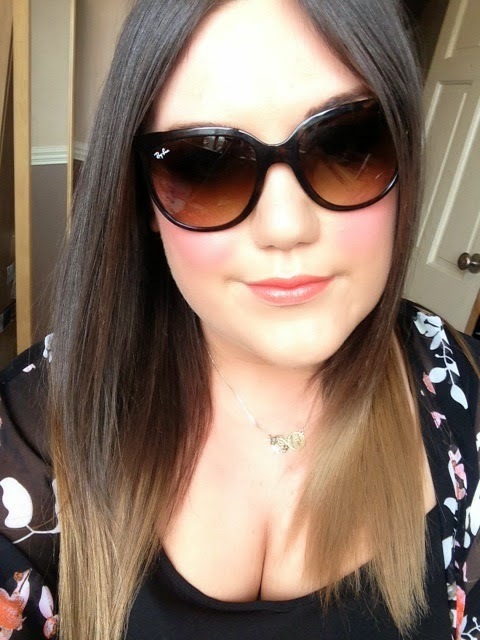 Dainty Dollymix UK Beauty Blog: Review: Ray Ban Sunglasses & GIVEAWAY! As the sun is shining i thought i would write up my post...and giveaway of these stunning Ray Ban Cats 1000*. When browsing the Sunglasses Shop website these Ray Bans caught my eye instantly! I love the cat eye, from experience i know that they suit my rather rounded face shape wonderfully, and i chose the light havana colour as i feel that they are a little softer on my face to black. They retail for £113 on the Sunglasses shop website which for me i think is a pretty reasonable price for a pair of designer sunglasses and is definitely on the cheaper side of money I've spent on glasses. Every year i treat myself to a new pair of shades, last year was the year of the Ray Ban wayfarers and as much as i still love and cherish them, i fancied something slightly different. Im not sure how much these actually suit me, i think my face may be slightly too big for them but nevertheless i know i will get a lot of wear out of them when i go to Morocco at the end of the month. I am also giving away a pair of these sunglasses courtesy of the Sunglasses shop. Sunglasses shop are a UK website that specialise in authentic designer sunglasses from many brands for both men and women. They also offer free UK delivery. You can enter up to 4 times. Liking Sunglasses shop on Facebook is mandatory as they are supplying the prize. An additional three entries can be had my following me on twitter or liking my page on facebook or subscribing to the Sunglasses Shop Youtube Channel. The giveaway is open now and lasts 2 weeks so will end on the 21st July, perfect time for your summer holiday! Good luck!